Best Anarkali Suits for Bridesmaid - Get The Best Look! 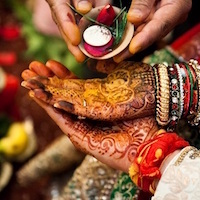 Indian weddings are all about dazzling clothes, great food and fun time for the entire family. Right from the Haldi ceremony and sangeet, to the main wedding and the post wedding parties, it’s all about looking your best and glamorous with spectacular Indian outfits. 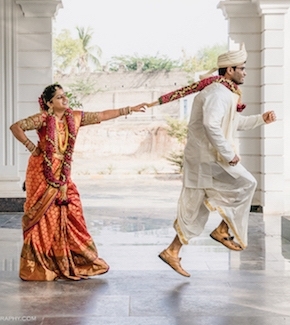 Usually, in any wedding – the bride has it all! Right from her wedding trousseau, hours of beauty salon sessions and makeup trials; the bride is always well prepared and groomed for her D-Day. But, if you are going to be a bridesmaid, this post is for you, best Anarkali suits to get your share of eyeballs. So it only makes sense that if you are her bridesmaid, it’s up to you to claim your fair share of attention too. Bridesmaids-to-be, we wish you also dazzle alongside the bride and look your best on your loved one’s D-day. We know as the bridesmaid you are anxious to find the perfect outfit to complement the bride and earn a few praises yourself. Here we give you some tips on how to choose the right Anarkali designer suits for a wedding party. This Anarkali suit with intricate embroidery at the top and beautiful shades of pink and orange is an outfit that oozes class all over! The off-white bottom with the beautiful striking colors and lovely thread work will leave your guests stunned. A most attractive and sophisticated looking Anarkali suit, this is a must add to your wardrobe if you are the bridesmaid. This beautiful deep pink lehenga suit is absolutely stunning for a bridesmaid to flaunt at her best friend’s wedding. The asymmetrical hemline and long sleeves give a slim look and the intricate embroidery on the velvet top looks regal. Paired with high heels and a high ponytail, this suit is the perfect outfit for any party. We also fell in love with the neck pattern which is unique and playful. We stumbled upon this gorgeous Manish Malhotra Anarkali designer suit which has a gorgeous pastel shade and golden embroidery. The two layered skirt in contrast colors lends an ethereal royal touch and any bridesmaid would love to adorn this at her best friend’s wedding. The flowing hairstyle with soft curls and minimal makeup look goes well with this and we think you can nail it too. This would particularly look good for the main wedding function since it is absolutely regal. Muted tones and gold shades are always elegant and for a girl who loves to wear something that spells comfort, style, and grace, this Anarkali is the perfect fit. The work at the neckline is an added attractive feature and paired with chandelier earrings and high heels, it could make your day! Crepe is a beautiful fabric for wedding wear and it can lend itself beautifully to beautiful and stylish dresses. The net dupatta and embroidered flower patchwork with the with golden border are the highlights of this beautiful dress. 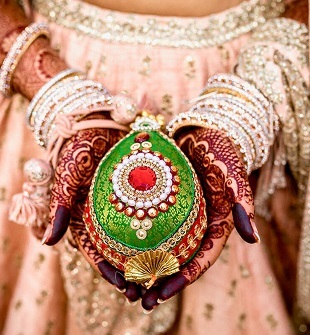 Bridesmaids can opt for such beautiful colors for evening wedding parties. Green is one of the popular colors this wedding season and green outfits be it sherwanis, sarees and Anarkali suits have been selling like hotcakes at the market. This gorgeous embroidered Anarkali suit is the right choice for pre wedding ceremonies. It allows free movement so that you can dance away, stylish cuts and a beautiful color combo of green, off white and black. Another beautiful and one of the best Anarkali suits that caught our attention is this lovely soft colored outfit with intricate designs all sparkling stone work all over. If you are a bridesmaid who loves to look as grand as the bride herself, we think this particular Anarkali suit would be perfect for you this wedding season. If you are looking for something different, unconventional then this design is for you! It has no heavy work but silk always creates wonder. The off-white & magenta combination will give you a simple and elegant look. These lovely designer salwar suits and designer, best Anarkali suits are pretty options for bridesmaids to wear for all important wedding ceremonies like Haldi ceremony, sangeet, and even the main wedding. While they add a hint of glamour, they also make you look traditional and royal. Depending on the time of the weather and day, you can also choose your makeup and hairdo. If you opt for the designer suit with less work, go for a heavy dupatta and vice versa. One tip is for the bride and bridesmaid to wear complementary colors so that both stand out in their own unique way.